Lehman trike dealer has complete parts, accessories and service for Harley-Davidson, Honda, Suzuki and Yamaha trikes and motorcycles. I started doing Mobile Service and then got a "Real" Shop in 1991 and I love it! Best thing I ever did! I found what I like to do so it aint work, most of the time anyway. Then in 1994, we became the first Lehman Dealer here in California. It was at this time we started to also work on the Goldwing doing trike conversions and service. The Honda Goldwing really opened my eyes to a whole new world! 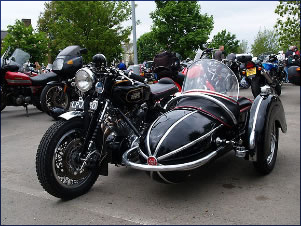 "Amazing" SO CAL TRIKE CENTER is also a Champion Trikes and California Sidecar Trikes dealer too! We are the ONLY one to do all three of the BIG BOYS and the oldest trike dealer here in California. So ifn' you want your trike, weather it is a Honda or a Harley built, or sServiced, or maybe you want something custom, we can do it! Stop by and say "Hi!"